We are so excited you joined us for this awesome event we are participating in this week! 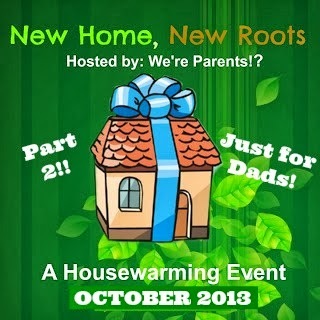 New Home, New Roots: Just for Dads, hosted by We’re Parents is going to be an awesome week long event featuring some great reviews and giveaways for things DAD needs in his new home! We hope you check back in daily! Brylane Home was started in 1998 to make consumers’ lives easier by keeping them up to date with the latest styles, colors, and designs. They don’t think you should have to wait for a sale, so everyday they offer the best prices! The company actually consists of two divisions: Brylane Home & Brylane Home Kitchen. Brylane Home is known as “America’s White Sale Catalog”. With everything from Fashion bedding to Housewares to Bath items, they also offer Floor covering, vacuums, sewing, and ironing products to complete your home shopping experience. The Brylane Home Kitchen division was added in 2000 to bring customers hard-to-find kitchen and home essentials. In 2005, the company merged the two divisions together to form BrylaneHome.com. Customers can now easily access everything from home fashions, decor, kitchen essentials, and the perfect gifts, all at one site and at unbeatable prices. Andrew is not much of a cooker. Don’t get me wrong, he can cook. He just doesn’t really like too. However, he loves having the “guys” over for football or even just because and I knew that there would be days that I wouldn’t be home that he would invite friends over and I wanted him to have an easy way to make some great foods (and also not make too much of a mess for me to clean up!). 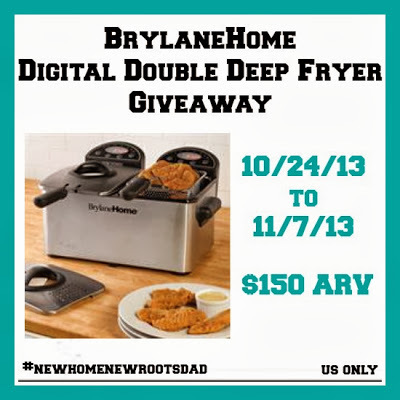 BrylaneHome’s Digital Double Deep Fryer was the perfect solution for our new home! Featuring two separate sides, allows you to use this deep fryer to cook two different things at the same time. Each side features a 12 cup fryer with see-thru window, digital temperature control, splatter-protect lid, and the housing is stainless steel. Are you looking for a special gift to give this year? If so, this giveaway is perfect. My husband doesn’t cook in kitchen at all. He is a grilling man and that is as far as he gets. This would be a great gift I could surprise him with this year. No more excuses of not knowing how to use a frying pan. Here is a double deep fryer and its digital. Enter below for your chance to win. Want to win your own? Visit We’re Parents!? 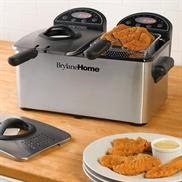 to check out the review then enter to win a Digital Double Deep Fryer of your own below! 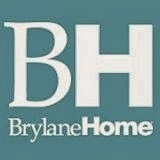 BrylaneHome products are a must have for dad in his new home! The Giveaway will close late on the evening of November 7th. The winner will be chosen at random through Giveaway Tools. The winner will be announced both on Giveaway Tools form as well as notified by email and announced on We’re Parents! ?’s Facebook. The winner will have their prize sent to them by BrylaneHome. We’re Parents!? is not responsible for prize shipment. Must be 18 years and older. Facebook, Twitter, Pinterest, and Google are in no way affiliated with this giveaway. No Purchase Necessary. US Only. I would love to have the bread maker that makes oblong loaves and has the baguette trays. During the summer I don’t turn on my oven but love to make bread.